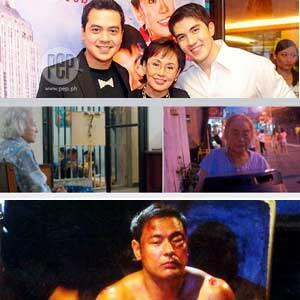 Gawad Tanglaw will confer the Best Picture award to three films released in 2009: In My Life (top frame), Lola (middle frame) and Dukot (bottom frame). In My Life starred John Lloyd Cruz, Luis Manzano and Vilma Santos while Lola was topbilled by Anita Linda and Rustica Carpio. Allan Dizon played an activist tortured by the military in Dukot. Gawad TANGLAW has chosen three films as the Best Films of 2009, one of them is a mainstream film while the two others are independent productions. The family drama In My Life, the internationally recognized film Lola and the socio-political film Dukot all have the right to be called the Kapuri-puring Pelikula ng Taon for 2009. Two personalities will be given posthumuos awards this year: the Lifetime Achievement Award will be awarded to the late Inday Badiday while the Gawad TANGLAW ng Pelikulang Pilipino will be conferred to the late Rudy Fernandez. Meanwhile, the acting talents of Coco Martin and Zaijian "Santino" Jaranilla are recognized with the Presidential Jury Award for Excellence in Acting and Natatanging Gawad TANGLAW para sa Sining ng Telebisyon, respectively. Composed of members of the academe from various universities, Gawad Tanglaw has been coming out with its honors list annually. The Gawad Tagapuring mga Akademik ng Aninong Gumagalaw will hold its awards night will take place on March 3, 2010 at Jose Rizal University. 12. Best Sports Anchors Dyan Castillejo, Marc Nelson, Tommy Manotoc Jr.